MER – How Much Does War Cost Delve? 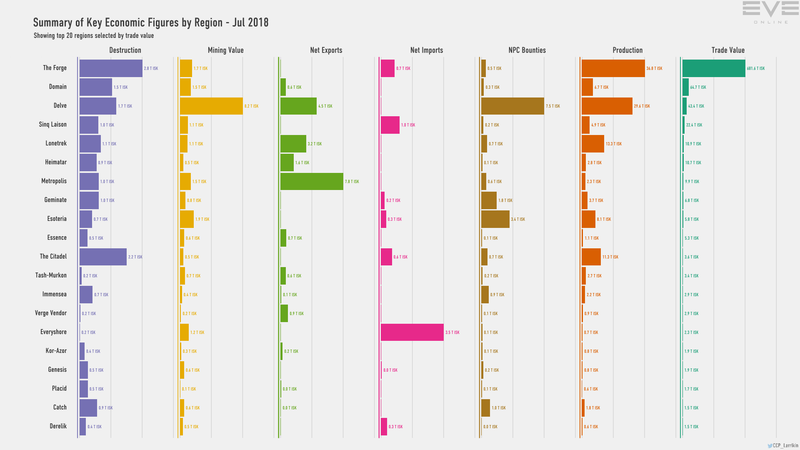 CCP has released the Monthly Economic Report for July 2018 so we can see what impact moving off to war has on the Imperium’s economic engine in Delve. So I will be comparing this to the June report which was the last peacetime period. We might as well dive straight into mining output, as that is where Delve and the Imperium dominate every month. July saw a big hit to mining output in Delve, dropping from 14.7 trillion ISK in value in June to only 8.2 trillion ISK in value in July. That is only 55% of the June output, a 6.5 trillion ISK reduction. A lot of Rorquals were clearly docked up as capital and super capital pilots flew north to Cloud Ring. And while, in the past, I have had to point out that changes in output might be related to the price in minerals from which the measure is derived, this month the economic indicators show that mineral prices were flat, even rising ever so slightly as the month moved on. So there is the cost of war. 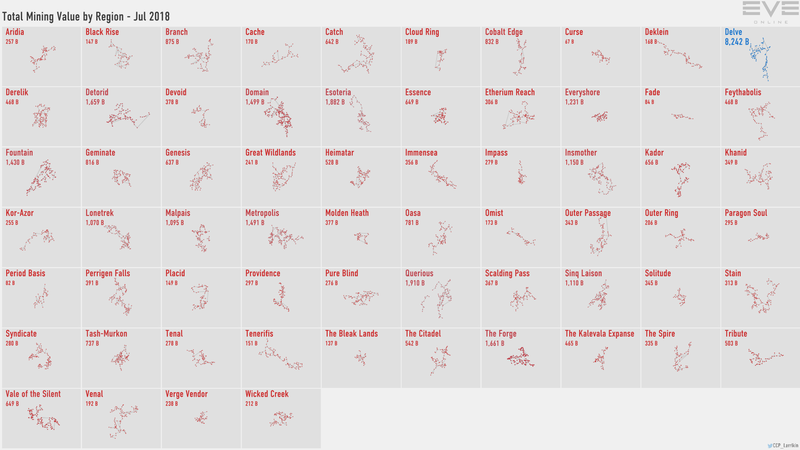 Regions in northern null sec, where a lot of the war is occurring, suffered downturns as well, save for a few like Branch that stayed stable or even rose a bit. There is no bar chart this month so we cannot see the relative rankings easily, but even a diminished Delve is still dominant. Then there is the NPC bounty output to look at. As with mining, NPC bounties in Delve were down. In June the number was 11.2 trillion ISK, but in July that number sank to 7.5 trillion ISK. 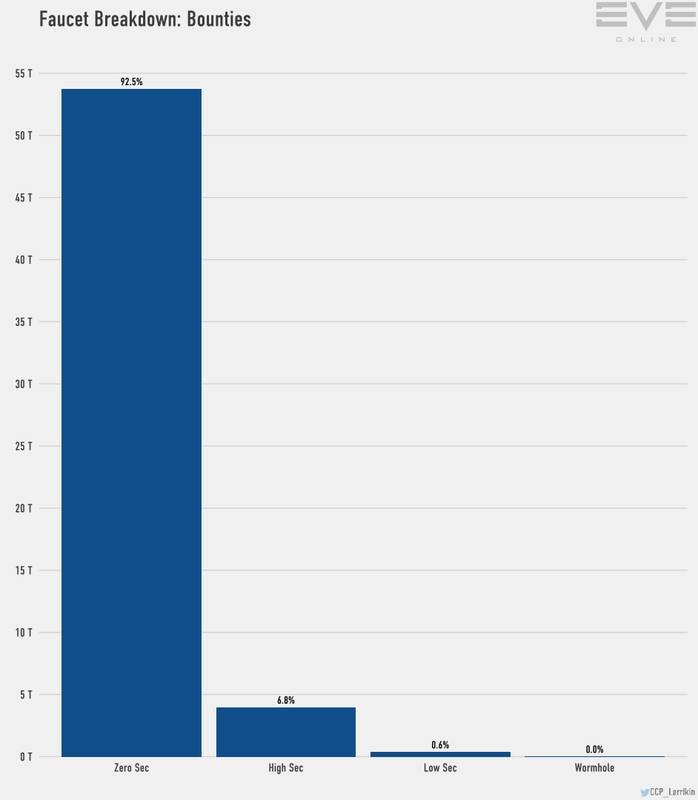 Unlike mining, which has to be sold or used in manufacturing to be turned into ISK, this drop saw 3.7 trillion ISK less flowing into the pockets of Delve pilots, with a corresponding reduction in taxes for corporations. I wish that the bar graph for this data had been included… and I am too lazy to make one myself… because you could more easily see Branch, where many northern players have gone in order to escape the war and keep krabbing, creeping up in value compared to Delve. July saw Branch hit almost half of Delve’s number, up from less than one third in June. The reduction even saw a slight change in the sec status balance of bounty payouts. Null sec dropped 0.8% causing the percentage for High sec space to rise just a bit. 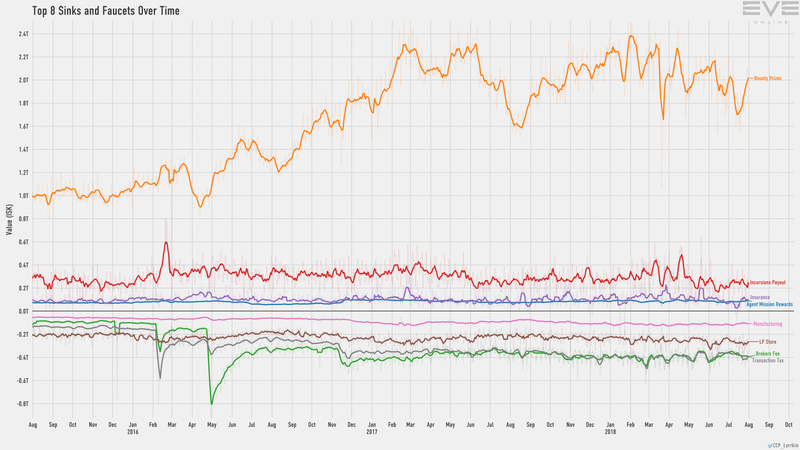 Overall NPC bounties saw a mid-month dip. War activity, move ops and battles alike, took people away from ratting. Or, took some people away from ratting for a bit. Even the bottom of that dip is still pretty high as an overall number. And, ever so slightly, incursion payouts saw a dip at the same time while insurance payouts went up during the dip. On the trade front Delve stayed steady. Instead it was Jita that saw the big boost, supplying the northern war front. Trade in The Forge was up by nearly 50 trillion ISK in July. 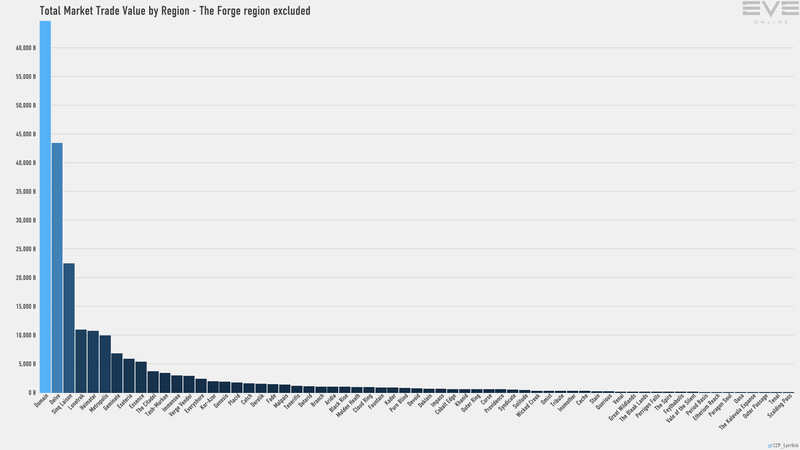 At leas there we have the bar graph to illustrate the dominance of The Forge, home of Jita. Without The Forge you can see Delve holding steady in third place behind Domain, home of Amarr, the second trade hub of New Eden. When it came to contracts Delve again stayed steady while The Forge surged. That surge may be related to the war, at least indirectly, but seems likely to be more about mutated modules from Abyssal space as they are becoming more readily available and can only be traded via contracts. Here again The Forge surged, but Delve sank some. This may be due to a shortfall of minerals in the region. I know we were already importing minerals from Jita to support production, but with the drop in mining there have been requests from leadership going out asking that we make sure and list minerals in the Delve market because they are needed. This was a key speaking point for The Mittani during the most recent coalition fireside chat. Minerals and ice products are in high demand. 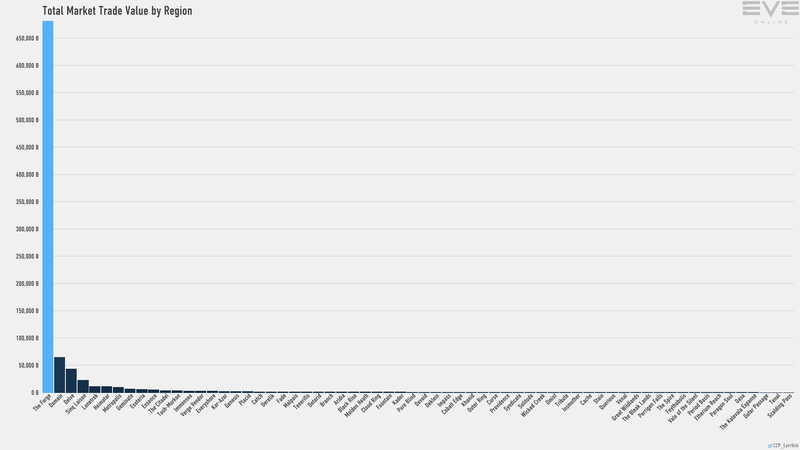 And then there is the war time chart, destruction by region. Since the report lags by a month we are only now seeing the numbers for the battles at UALX-3 where a Keepstar was destroyed along with hundreds of capital ships in two consecutive bouts. That boost the Tenerifis number by about 3.3 trillion ISK. In Delve the numbers were up a bit as those who kept on ratting and mining while the super capital umbrella was elsewhere paid the price. In The Forge however ganks were apparently down a bit compared to June. 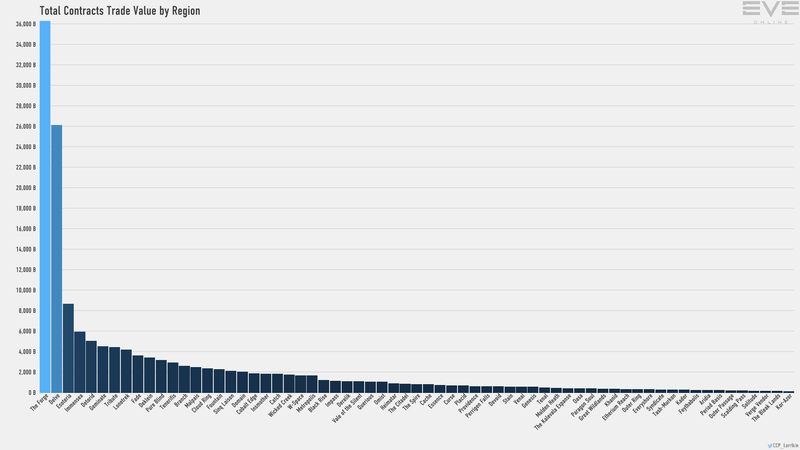 And, as usual, I will close with the regional stats chart that puts a chunk of the data into one chart. The July numbers reflect only the start of the pan-null sec war, with the opening struggles in the south. Already in August we have had two major battles with losses measured in trillions of ISK, so next month’s report should be interesting. Meanwhile the shortfall in mineral and ice product production may send the prices upward. Something to keep an eye on come next month’s MER. 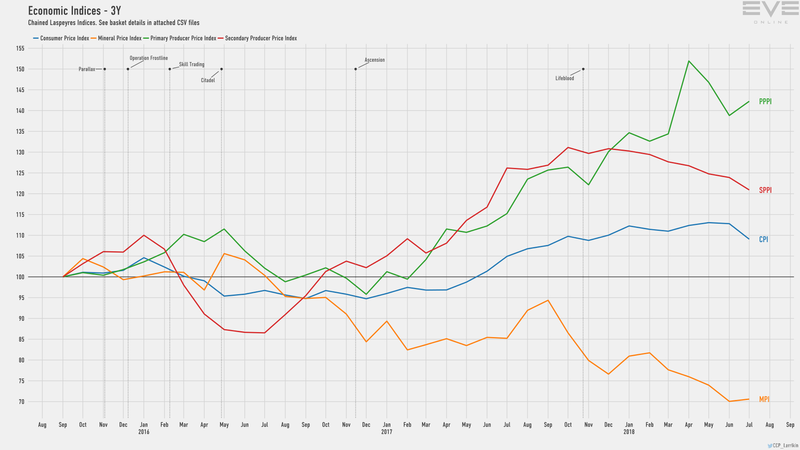 You can find the July 2018 Monthly Economic Report and all of the charts it provides, along with the raw data from which they were made, over on CCP’s site under Dev Blogs. This entry was posted in entertainment, EVE Online, Null Sec and tagged Delve, EVE Monthly Economic Report on August 13, 2018 by Wilhelm Arcturus. CCP gave an IWIN button to Goons with Citadels expansion. Due to the extreme amount of minerals and rats available in every region, Goons could condense their empire (previously spreading over 8 regions) into 1 region and still get the same or more rewards. Theoretically everyone else can do the same, but only the Goons have the manpower to use this abundance of materials. These changes served absolutely no other purpose than keeping Goons afloat after World War Bee. 3.7 trillion is about 37 titans. The opportunity cost of not putting out full rorquals for a month is higher than the cost of a major titan battle. Staggering. Regarding Gevlon’s view I have a different conspiracy theory. I don’t think CCP colluded with Goons, I think they were carefully led by them, particularly Mynnna. His null mining changes were reasonable fair and had the for CCP unintended consequence of catapulting Goons ahead of their anti-mining elite pvp rivals. The moon goo changes put in the final nail. @Stabs: your idea was believable exactly one month after implementation. Then CCP should have said “the changes had unintended consequence of extreme abundance of minerals and removing competition for mining fields, so we implement the following changes…” They did this when faction warfare LP was abused. Not doing it is clear favoritism. @Gevlon – The problem with any theory about a vast Goon conspiracy is that you have to explain why we’re just not seeing a corollary to Malcannis’ Law, where those willing to adapt to changes in the system, and in a position to take advantage of them, are more likely to benefit from them. You are, in essence, saying that Goons couldn’t be winning on their own, so CCP must be helping them, which pretty much stems from the “Goons are bad” narrative from BoB over a decade ago. You seem to have adopted the philosophy of the people who lost the Great War as a central aspect of your belief. And I guarantee you that things look different from the inside. Institutional lore in Goons is that CCP is always working against them. This looks like paranoia, but CCP has done just enough things over the years… from T20, which set it in motion, to things like the “No Sions” rule for the CSM… to fuel that point of view. Even the introduction of citadels, which you say saved Goons, were introduced, in the Goon point of view, just too late to save their empire in the north and just in time to help those taking it. It made the “reconquista” pretty much impossible at the moment and parked a Keepstar and a super capital force one gate from our low sec outpost in Saranen. Undocking in Saranen a little over two years ago saw three hostile Fortizars on grid with the station. In reality, what saved Goons was the attackers not being willing to finish the job. There was token resistance in Delve. LUMPY contested a couple of systems. Some interceptors early on, a few capitals, and one fleet of Machariels a little later (which flew into a dead end pocket in an incursion and got camped in) was about all the north had to offer. We were allowed to setup in Delve in relative peace. The region was barely camped and the long standing tradition of intel and defense fleets kept the few interlopers who showed up at bay. And it’s not like it wasn’t possible. Delve has NPC space. I’ve spent most of the last year on deployment with Reavers in NPC Pure Blind blowing up everything from supers and Rorquals to VNIs and Procurers, and the MER shows the results. A determined effort early on could have kept Goons down, but nobody wanted to do that. Instead groups carved up the north, settled in, then fought with each other. Oh look, TEST is our ally again! Why? Because it was easier for PL and NCDot to shoot them than go all the way to Delve. Now we win in the field and on Reddit! But the clincher against favoritism lays on the Serenity server. Did you watch the Rooks and Kings video I posted a while back? On Serenity we have no Goons and no CCP and yet one power went all out and managed to dominate null sec, driving its rivals off the server. And they don’t even have moon mining yet, so passive income was still a thing. A conspiracy or collusion is unnecessary to explain what is happening on Tranquility, because we’ve seen it happen already on Serenity. This is what happens with PvP games where you allow the winner to keep the advantage from their win. This is why companies favor match style games, such as battlegrounds in WoW, where everything resets after a win. If you cannot restore the status quo then eventually somebody will pile up enough advantage to win and keep winning. And, in EVE, restoring the status quo means breaking the sand box, which is the only thing that would kill the game more quickly than the eventual end game towards which null sec has been marching since it launched. The only surprise here is that it has taken so long on Tranquility.